Oh, Morocco. What am I going to do with you? As I was being bombarded with, “Carpet, Madame? 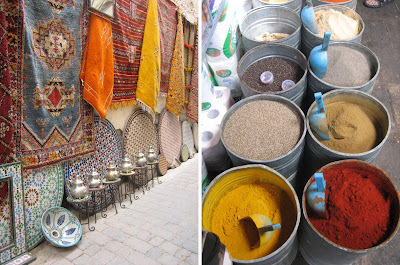 Spices, Madame? Antique Berber bracelet, Madame?" I thought I might go mad. Not only was the pressure to buy things too stressful, being called "Madame" night and day had me rethinking my career options. And then there was the line I kept hearing, "I give you democratic price.” I shrugged it off as a bad translation for “fair,” but now I'm thinking you were consciously trying to appeal to my Western sensibilities. “Democratic” being code for the freedom to spend lots of money on stuff I don’t need. In the old quarter, or medina, of Fez, there's no such thing as personal space. 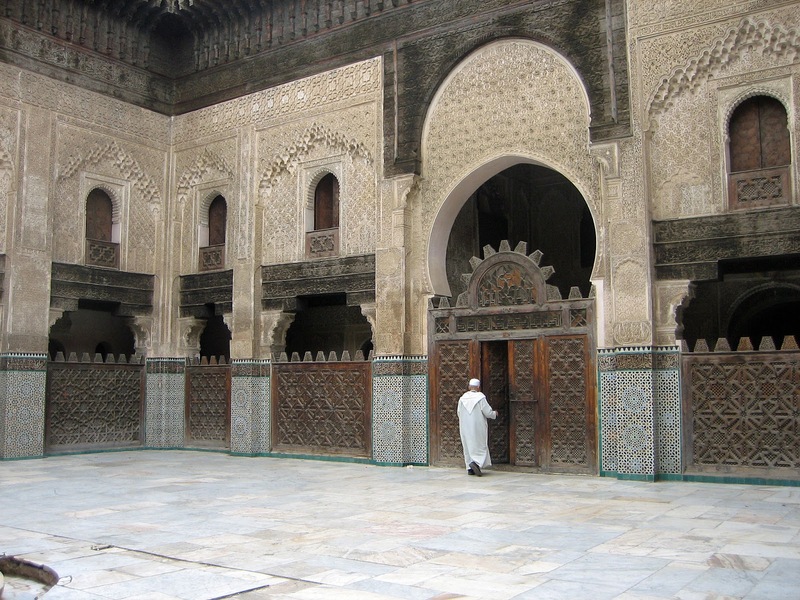 Everywhere I turned, I shared precious oxygen with animal, vegetable or minaret. 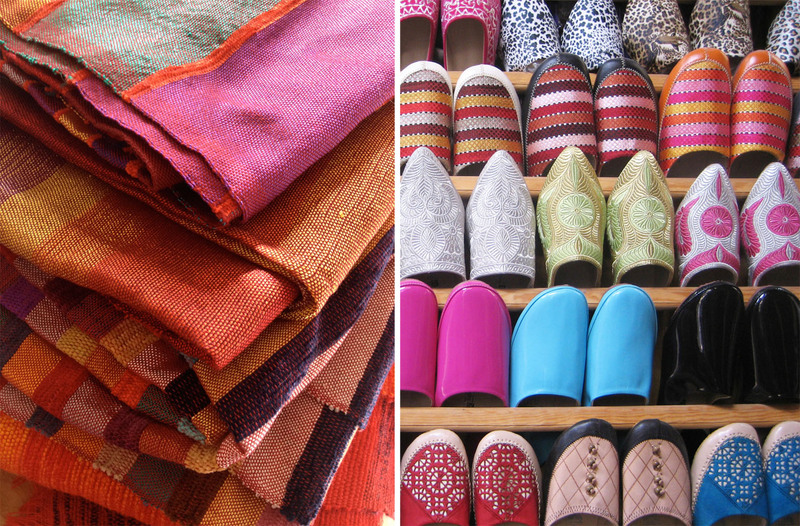 Not only was I confronted by shopkeepers' democratic come-ons, I was besieged by shiny objects, brilliant fabrics, exotic footwear and leather goods so fresh, the animals were practically still wearing them. Severed heads, hooves, organs and intestines hung like prizes. 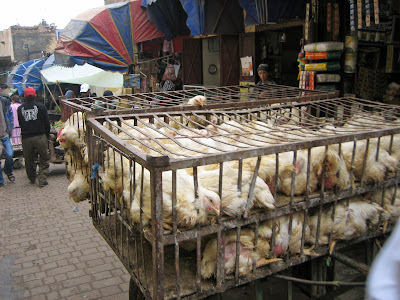 Live chickens in front of food stalls awaited their fate like dead man squawking. The fish souks were swimming with snails and sardines as cats congregated for their catch of the day. 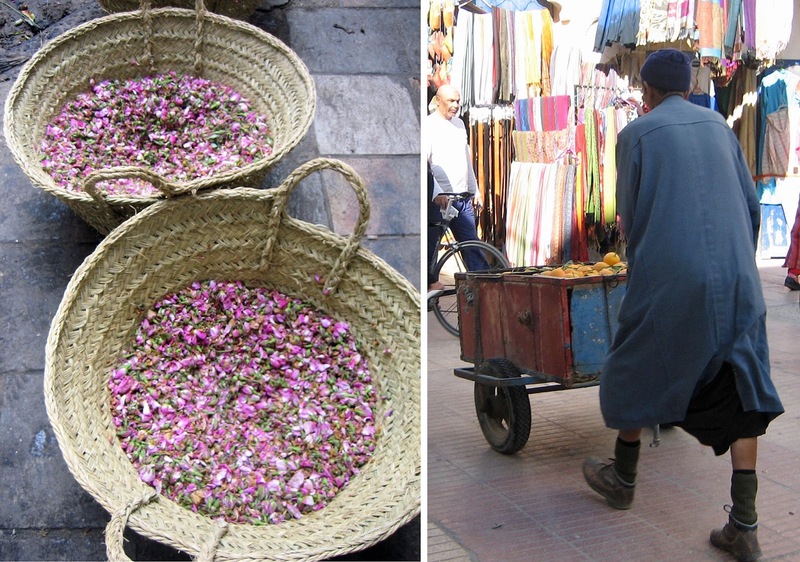 Produce and spice vendors were peppered on the streets advertising everything from apricots, artichokes and mint to rose petals, herbal remedies and argan oil. 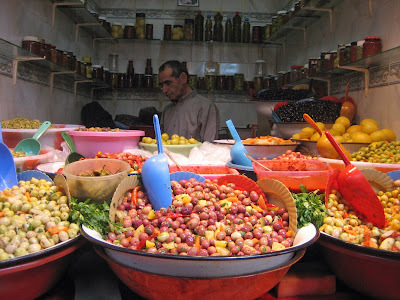 Dried fruits, nuts and sticky sweets glistened as ubiquitous olives reigned salty and supreme. I was a sensory prisoner inside the gates of a loud, loud land. 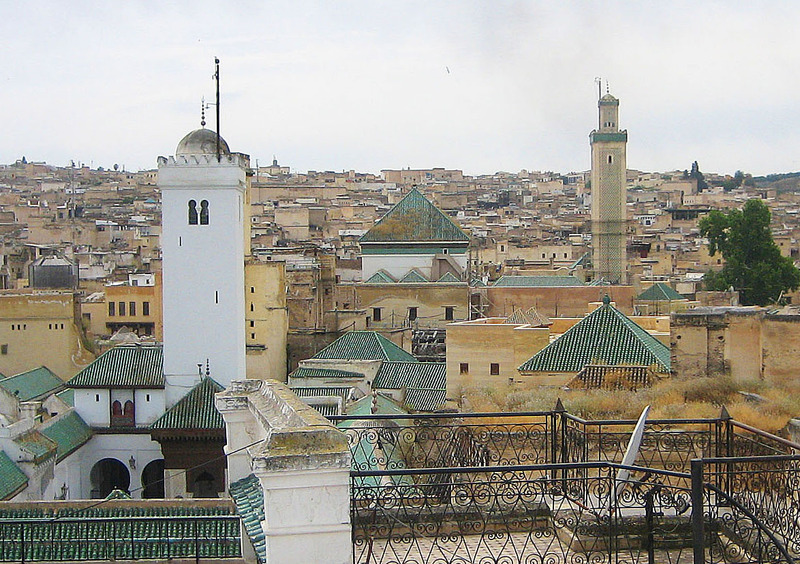 I came to Fez to experience the largest and most well-preserved medina in the world. Very little has changed since the Middle Ages—other than a few things like electricity and Nike knock-offs. An imperial capital for the last 10 centuries, today it’s a UNESCO World Heritage site still renowned for its culture and cuisine. 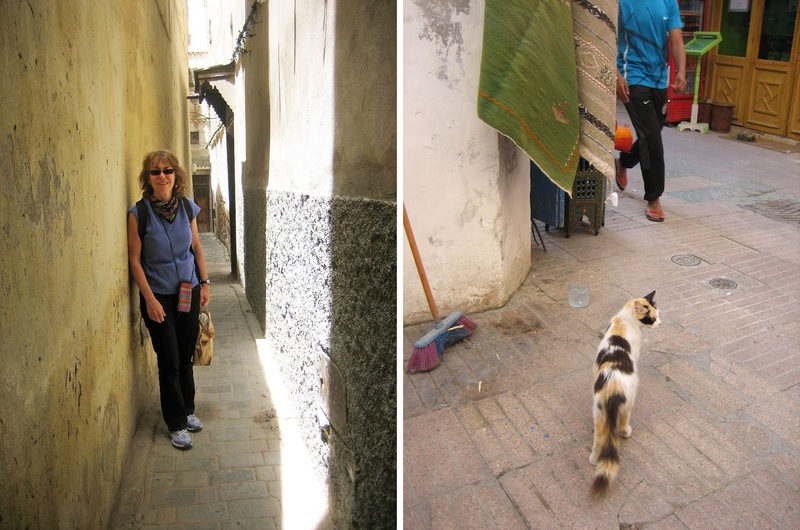 Narrow, maze-like alleys sneak around for a mile, inhabited by souks, fondouks, mosques, madrasas, museums, artisan quarters, tanneries, restaurants and riads. The Fez medina is said to be the world’s largest urban car-free zone which explains why mules and men with rolling carts transport every conceivable object through the anachronistic streets, shrieking “Balak, balak!” (move to one side). I was lucky to make it out, toes alive. After four nights in Fez, I still didn't know where I was at any given moment. Apparently it was written on my face because some boy or man would miraculously appear and insist on leading me for blocks, against my wishes. He would be equally insistent on a generous reward upon our arrival. One time I tried to dodge an irrepressible “guide” by sneaking off in the opposite direction when he wasn't looking. But out of thin air, he appeared, insisting that now I was really going in the wrong direction. Alone time must have been laughing at me from solitary confinement—a place that was starting to sound pretty good. 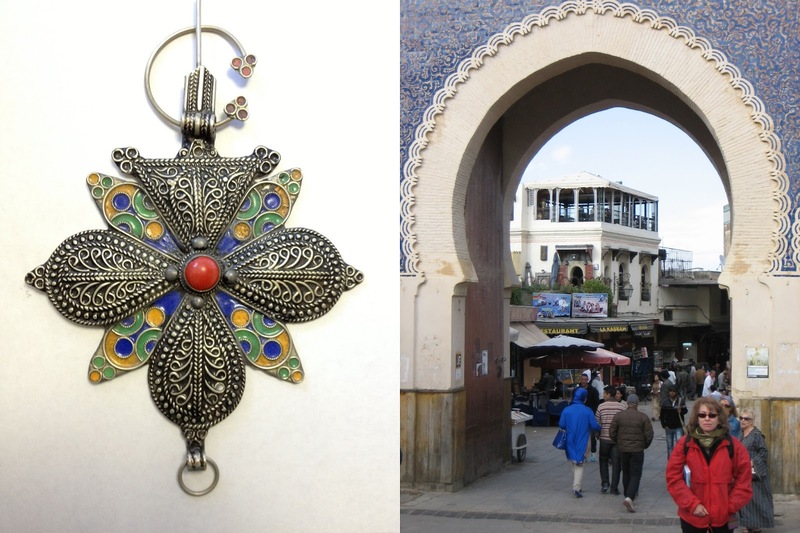 Once when I was looking at a street peddler's beautiful amulet pendant for sale, he told me the family history of the Berber village it came from, clear across the country near Algeria. 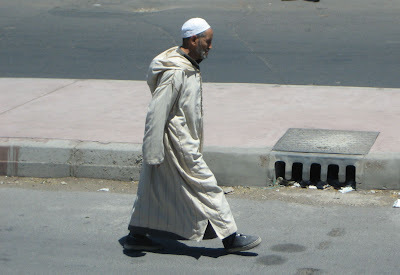 Then, out of the blue, he pointed to an old man in a caftan who happened to be walking by and proclaimed him to be the Berber father in the story. The old man gave him an I've-never-seen-you-before-in-my-life look and kept walking. Even though I didn’t buy the story, I bought the pendant. After all, I was smitten with it, and our spirited negotiation resulted in a very democratic price. 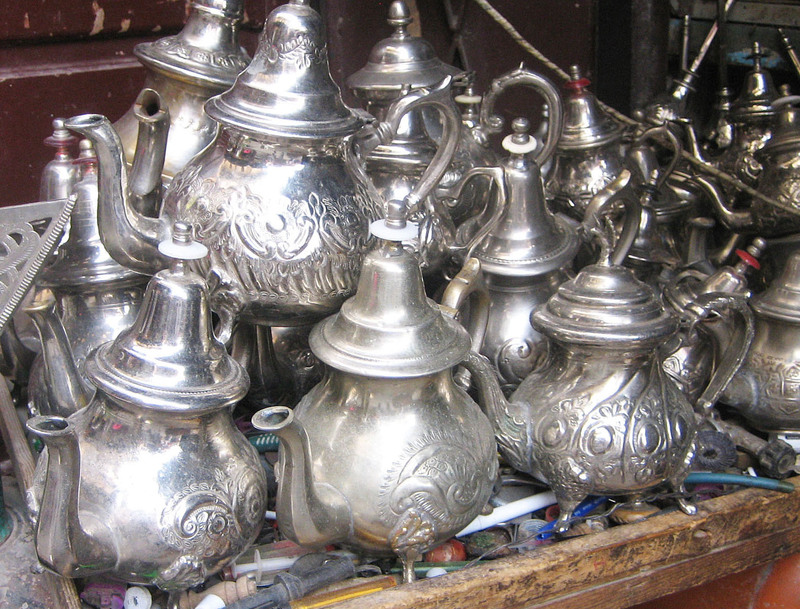 And then there was the time I was in a souk looking at two silver teapots. As the shopkeeper was turning up the heat on me to buy, I asked him why one cost half as much as the other, and he said, “It’s same, but different.” Hmmm. You mean like Morocco and America are the same? 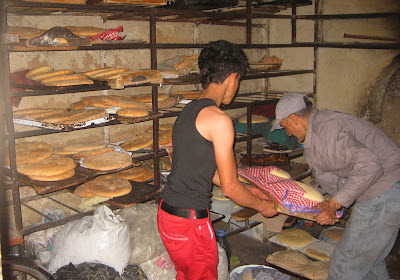 You have olive souks. We have Olive Gardens. Funny, no one ever had to sell me on the olives, though. Those salty, savory, spectacular succulents sold themselves. So I’ve come to realize that any place that serves olives for breakfast, lunch and dinner and isn't an Olive Garden is worth enduring such a cast of colorful characters. After all, my country is full of colorful characters too. Morocco, your Fez medina really is a different world. But same. 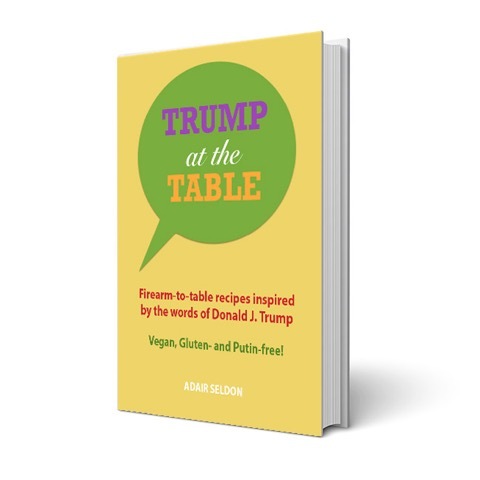 You need to submit this to travel / culinary magazines. This is simply fabulous. Love this, so glad you had a great time. 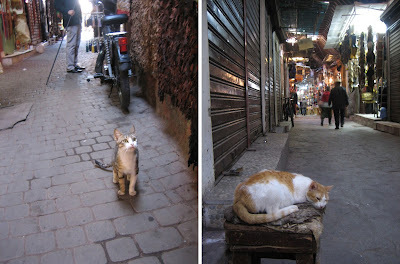 Very similar to our experience in Marrakech. I agree with Cathy - Were you at any time fearful ? I read this and felt anxious for you... What an adventure. From a safety perspective, no I felt completely safe. I was in well-traveled tourist areas, and the people who weren't harassing me to buy things were very nice. 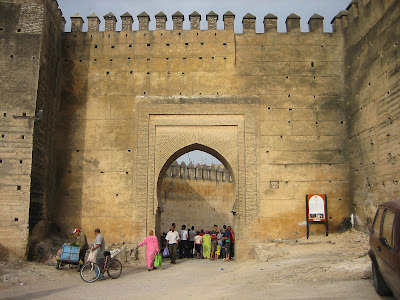 I wish I had spent more time outside of the touristy areas. Wow, Adair! Fabulous photos and wonderful writing! Can't wait for part 2 and 3! Future chicken tagines. You crack me up. lol. Love your photos. Looking forward to part 2 and 3. 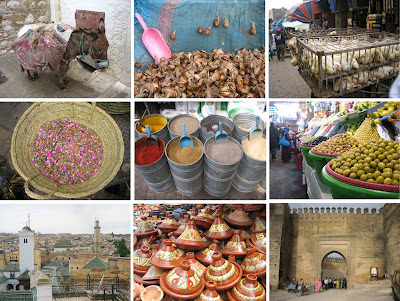 What a lovely, vibrant, full-of-life travel post ! It's been an awesome 15 minutes reading your thoughts and watching all those exotic pictures! Thank you, Nusrat, and welcome! 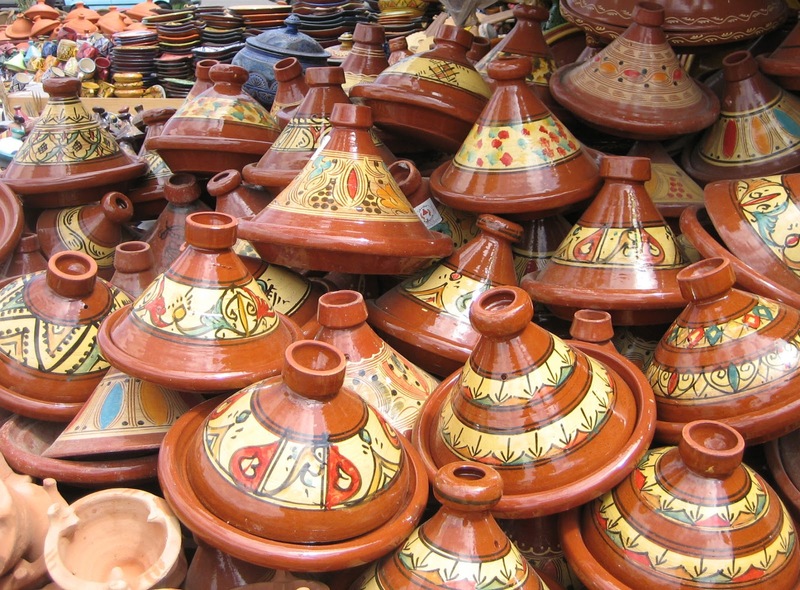 Enjoy your trip in Morocco! Amazing article about my country.